People look at the Dukan dam in Iraq's northern autonomous region of Kurdistan, 65 kms northwest of Suleimaniyah, which was built in 1955 and has reached its highest water levels following heavy rains in the region, April 2, 2019. Iraq's water ministry sought on Tuesday to quell fears that dams could collapse, as the country's main water reservoirs reach or near capacity after a very wet winter. "We are in control of the dams and reservoir levels," said water ministry spokesman Aoun Diab. "We are not worried about their safety or stability." Weeks of rain — compounded by melting snowcaps in neighboring Turkey and Iran — have almost filled Iraq's four central reservoirs and swelled its two main rivers, the Tigris and Euphrates. 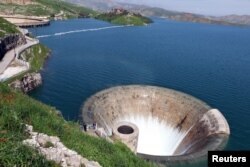 The Dukan reservoir in the northeast is holding more than its seven billion cubic meter capacity, with excess flowing out, Diab said. The Dukan dam is seen in the western city of Sulaimaniyah, Iraq, April 4, 2019. Dukan dam manager Hama Taher said the structure "had not witnessed water levels this high since 1988" and called on people living nearby to leave. The country's largest reservoir, held in place by the Mosul dam, holds nine billion cubic meters of water, some two billion short of capacity, Diab noted. "The ministry has warned people living in flood zones, is coordinating with local governments, and is monitoring the reservoir and dam pressure levels," Diab added. 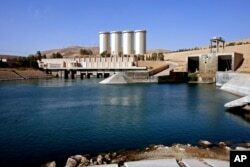 But environmental scientist Azzam Alwash said the Mosul reservoir was at risk. Built in part with gypsum, a mineral that dissolves in water, the Mosul dam requires regular cement injections to fill cracks in its structure. "If you don't fill them quickly, the foundation loses support and the smallest crack, if you don't catch it in time, will result in catastrophic failure," Alwash warned. "If the dam fails when it's full, the area will be under five meters of water," he told AFP. FILE - A general view of the dam in Mosul, 360 kilometers (225 miles) northwest of Baghdad, Iraq. Heavy rainfall this winter led to floods in Iraq that killed dozens and forced hundreds of families to flee, while also destroying crops and farmland. Floods in neighboring Iran have killed some 70 people in recent weeks. Despite reassurances by the Iraqi government, recent heavy rains have sparked concerns among local officials, the United Nations and observers. The World Health Organization said a downpour this week had displaced hundreds of families in Iraq's southern Missan province and another 2,000 were at risk of being forced to relocate. The Tigris' waters have been noticeably high in recent days, in stark contrast to the summer, when people could wade across the river's diminished flow in southern Iraq. Last month, more than 100 people were killed in Mosul when a ferry capsized on the Tigris, partly due to the high water levels.